Everyone is pretty familiar with the term 'e-learning' at this point, but what is microlearning? 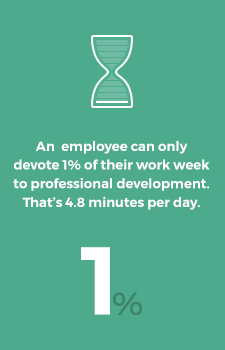 Perhaps the simplest way of explaining the term is that it is bite-sized bursts of knowledge, usually 8 minutes or less that are focused on targeted learning objectives. Microlearning modules are short objects that should stand on their own, but may sometimes be chained into longer learning events or learning paths. It can be watching a short video, viewing a flashcard, a short article or book summary, playing a quick game, a social interaction or listening to a podcast. It is helpful to engage multiple senses whenever possible to support different learning styles so the use of audio, video, animation, text and interaction is helpful. Microlessons also benefit from the old advertising adage of frequency, frequency, frequency. This repetition of message over time helps to cement the ideas. As David Allen, creator of the Getting Things Done time management programs put it "short lessons, delivered consistently over time can create big change." Athena has found that perhaps the most powerful approach is a combination of descriptive and prescriptive delivery. Set the context of a lesson and follow it with step by step, action-oriented advice for the solution. This combination helps make the information relatable to the learner and provides them with ideas for implementation. Microlessons should be accessible over mobile devices as well. Today's learners want information when they need it and that might be at home or on the road. What is Microlearning good for? Microlearning can be used to support organizational training and development efforts. As mentioned before, when a singular message is delivered consistently over time it can help create or reinforce behavioral change. 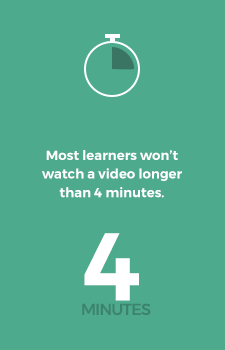 Microlessons can also be combined or 'chained' to create deeper dives or learning paths. You could use video to introduce a topic, a short case study, a threaded discussion for sharing insights, a book summary and a short quiz, presentation or other user activity to reinforce the knowledge and measure retention. Microlearning is often used as a blended learning solution. AthenaOnline created a platform called Leveraged Learning for its sister company The Institute for Management Studies to reinforce the concepts presented in its full day workshops with business thought leaders. Participants are given 30 days of access to a special site with supporting articles, micro learning videos and threaded discussion. This helps them remember what they learned during the program and share key concepts with others in their organization. Does Microlearning Replace Other Types of Training and Development? Be aware that bite-sized learning is not for everyone and certainly not for every need. Microlessons are a unique style of eLearning delivery all its own. It does not replace traditional pedagogical fundamentals of education and learning, but it can be a very powerful way to supplement them. It also lacks the engagement that can be enjoyed with a room full of participants working with each other and learning from their interactions in active learning exercises. Yes, some of that can be achieved with threaded discussions or other online interaction, but it does not have the same impact as a class filled with other people on the same learning journey. While microlearning may incorporate short simulations it is not the same as coaching and mentoring or on the job training. Bite-sized learning is a great way to support other activities however. Imagine filming portions of a classroom program, breaking it down into a 'best of' series and then sharing that with a wider audience. Micro elearning is a great way to share ideas that people might otherwise never have the benefit of receiving due to time, location or cost. Bite sized learning delivery is not 'either or,' but 'both and' approach. One that appeals to a younger generation of workers, like millennials who grew up on YouTube and smartphones. What Role has Athena Played in Microlearning? Athena developed the first micro-learning for enterprise training and development in the early 1990's as a part of our award-winning New Leader series of CD-ROM eLearning programs, which combined longer lecture and case-study materials with short bursts of wisdom to help support the learning. After running eLearning pilot programs followed by interviews with senior HR leaders of Fortune 1000 companies Athena found that learners gravitated toward shorter, quick-hit, bite-sized lessons over a deeper dive. Attention spans were becoming shorter and people were, even then, feeling the pressure to get things done as quickly as possible. Athena decided to take a radical departure from the way online learning was heading and began to work with faculty like Dr. Marshall Goldsmith, best-selling author of What Got You Here Won't Get You There, David Allen, author of Getting Things Done and Dr. Beverly Kaye, author of Up Is Not the Only Way to break their knowledge down into short, highly-targeted lessons that could be delivered using video over the internet which we called SmartBytes™. Athena launched our first video-based, micro-learning lessons on the internet in 1999, a full 6 years before YouTube was founded. Admittedly, our somewhat radical approach to learning got us kicked out a few offices with comments like "bite-sized lessons will never work, people need 3 hours or longer to learn anything" or even "video on the internet will never take off, you should stick to text or PowerPoint." Fortunately AthenaOnline weathered the initial, negative reactions to this brand new form of learning delivery and continued to build on what we were hearing from the users of this new methodology. As a new generation of learners entered the workforce Athena's approach to learning was exactly what they were looking for. Athena was also a forerunner in mobile delivery (or mLearning), becoming an Apple staff pick for mobile delivery in 2008. Now with a library of over 2,700 lessons and an extremely robust learning portal that can be customized to fit each organization's unique needs AthenaOnline is not only a pioneer, but a leader in the delivery of this 'new' form of learning.